Oasis have certainly been busy: their new collection features more of spring and summer's hottest trends than you can shake a stick at: ladylike chic, prints and florals, pastels, neons and nudes, the 50s and the 1920s...phew! I love the three looks pictured above: of them all, the first one is probably the most wearable (although obviously not for me, I'd have ketchup down it within three minutes of getting it on.) The buttoned-up white shirt (it's actually a shirt-dress they've used, here, and it's €75; the skirt is €62) is fresh and elegant; the skirt length, and the sheer panels in the shirt, stop the look from being too prim and proper. Look 2 is so fun; 50s shapes and clashing prints and colours, what's not to like? Apart from the crop top, a singularly unforgiving garment, perhaps best left to those who are teenagers, models, extremely confident or all three. The top is €50, the skirt is €56. Finally, look 3 shows that matchy matchy can be quite lovely when pulled off well, with a clashing belt, clean lines and, crucially, artfully messed-up hair to stop things looking too done. The bird print trousers are €56; the top, €53. 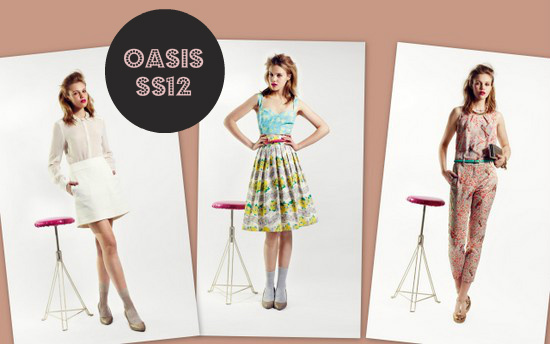 The Oasis SS12 collection is in store now, or available to buy online. What do you make of the looks above? I used to love Oasis and bought all of my clothes from there, but a few years ago I fell out of love. I am liking the sample in the above photo and will go and take a look at their website. Oasis is one of my fave shops ever! I think they've got a great collection there. I like the middle look best but wouldn't be sure it would suit me. Will have to pay them a visit. Hope you're on commission!! i love oasis! they have great stuff! love your picks! Love these looks especially the first and second. I really love the way the outfits look! Super lovely. I would definitely check their site. looks like they have so many awesome stuffs! I love that second outfit with the clashing prints! They have the cutest dresses for summer on their site! Lovely! This collection is so pretty! I love the second look, the mixed prints are so fun. I love how ladylike and unique these pieces are! I've been loving almost everything Oasis does recently with all the 50s skirts and dresses and printed trousers. Pay day can't come fast enough this month! Is the third one a romper? So cute!